Nick Foles and the Eagles are still alive. “Big Game” Nick Foles did it again. He was good to start, shaky in the middle, unbelievable at the end. Trailing by 5 with 4 minutes, 48 seconds to play in the season against the best defense in the NFL, on their field, Foles completed seven of 10 passes for 71 yards, culminating with a 2-yard touchdown pass to Golden Tate on fourth-and-goal from the Bears' 2 to make it 16-15 with 56 seconds to play. The Bears then missed a late field goal. After going 4-for-5 for 57 yards on the opening drive, Foles ended the next two drives with bad interceptions thrown from the Bears' 40-yard line and 21-yard line. 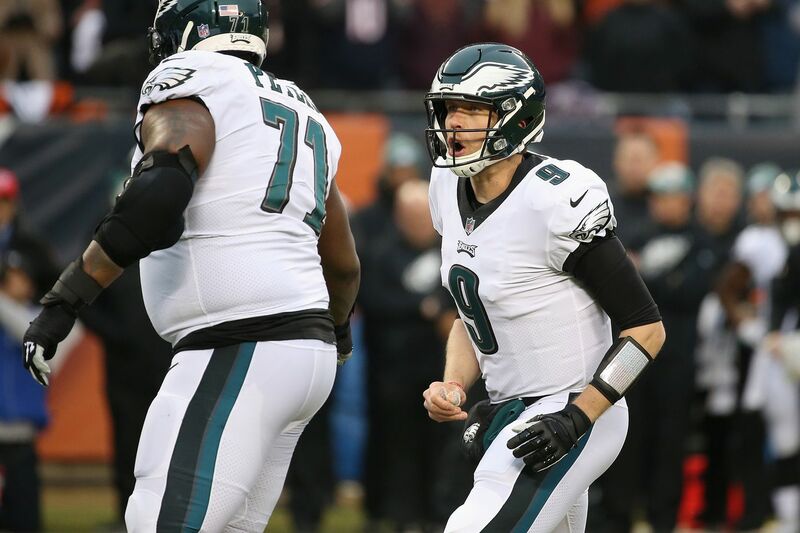 Foles engineered a third-quarter touchdown drive capped by a 10-yard TD pass to Dallas Goedert. Foles has thrown five interceptions and seven touchdown passes in his six starts this season. He finished 25-for-40 for 266 yards with two TDs and two interceptions. In the penultimate drive in the fourth quarter, Foles underthrew Tate, who was open deep against a linebacker. On the next play he overthrew Goedert, who was open for a first down. That precipitated an Eagles punt, but the Eagles' defense held and gave him another chance to extend the season -- and his career as an Eagle. Bears kicker Cody Parkey, who was a Pro Bowl player with the Eagles as a rookie in 2014, missed seven of 30 field goals this season, which ranked 28th among 30 qualifying kickers. Two of them came against the Lions at Soldier Field on Nov. 11, a day when he hit the upright twice with field goals and twice more with PATs. On Sunday he made field goals of 36, 29 and 34 yards. With 10 seconds left, he was given a chance to win the game. He pulled it. It left upright and the crossbar. The Eagles scored on their first drive, from their 25 to the Bears' 25, a 43-yard field goal. They had done that three times time in the five previous games after having done so just twice in their first 11 games. They’re now 8-0 in those 17 games. It was the best of times and the worst of time for the young Eagles cornerbacks. Avonte Maddox was outstanding early, but he was beaten on consecutive plays -- a 34-yard bomb, a 22-yard TD to Allen Robinson that gave the Bears a 15-10 lead with 9 minutes, 4 seconds to play, and a 25-yard teardrop to Robinson that put the Bears in field goal range with 35 seconds left. Linebacker Nigel Bradham and cornerbacks Rasul Douglas (eight tackles) stood out. Bradham spied Trubisky for most of the game and forced two incompletions. Douglas made two trademark tackles in the flat. Former Eagles tight end Trey “Philly Special” Burton was inactive due a groin injury that dogged at the end of last week. The Bears did not play All-Pro safety Eddie Jackson, who compiled six interceptions this season. He did dress. Three penalties on the Bears' defense -- unnecessary roughness, 12 men on the field and pass interference -- accounted for 52 of the 83 yards accumulated in the Eagles' third-quarter touchdown drive. For the first three quarters the Eagles contained All Pro pass-rushing linebacker Khalil Mack with outstanding efforts from tackles Jason Peters and Lane Johnson and a strategy of attacking him. Then, after the bears toook a 5-point lead, he beat Peters inside and forced a first-down incompletion and knocked Golden Tate off his route on second down. With 26 seconds remaining in the second quarter, officials erroneously called a 25-yard pass to Anthony Miller incomplete. It was, in fact, complete. It also was stripped by Eagles cornerback (and former Bear) Cre’Von LeBlanc as the pair tumbled to the ground. However, since neither team recovered the ball -- it died at the Eagles' 4 after the whistle blew -- upon review, officials correctly nullified both the catch and the fumble and the teams proceeded as if it was an incomplete pass.